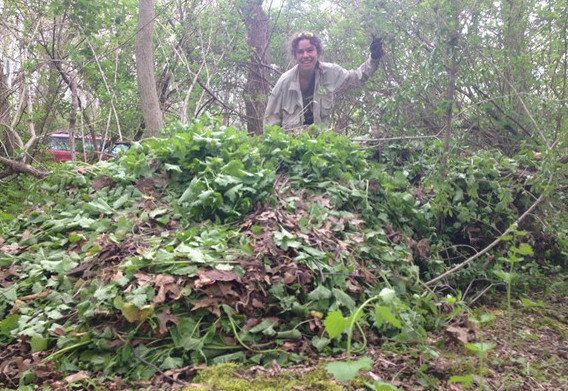 A mountain of garlic mustard removed from the site and composted. The Penn State student chapter of the Society for Ecological Restoration (SER) joined with the town of State College, PA to restore native flora to the entrance of Walnut Springs Park on University Drive. In late Fall of 2014 students removed the invasive exotic shrub layer, predominantly European Privet and honeysuckle species. The emerging garlic mustard was removed in early Spring of 2015 to make way for native tree saplings and forest understory herbs. The plants were purchased at the Central Pennsylvania Native Plant Festival at Shaver’s Creek Environmental Center with a generous donation from the Pennsylvania Native Plant Society. Several residents of the Walnut Springs neighborhood joined the Penn State SER students for the big planting day on May 3, 2015, and some donated native forest understory herbs from their own gardens. Tree saplings included in the restoration were Quercus macrocarpa (Bur Oak), Celtis occidentalis (Hackberry), Carya cordiformis (Bitternut Hickory), Carpinus caroliniana (Hornbeam), Asimina triloba (Paw Paw), Viburnum lentago (Nannyberry), Sambucus canadensis (Black Elderberry), and Magnolia acuminate (Cucumber-Tree Magnolia). The student group will be erecting an informational sign on the ecological benefits of restoring with native plants, as well as continuing to monitor the health of the restored site. Contact chapter member Katy Barlow for more information and if you would like to be a part of future work at Walnut Springs.